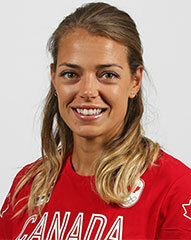 The Canadian record holder in the women’s 800 meter, Melissa Bishop is currently one of Canada’s finest track and field athletes. Melissa was born August 5th, 1988 in Eganville Ontario to parents Alison and Doug Bishop. A graduate of the University of Windsor, Bishop is only the third Canadian woman to post a time under 2 minutes in the 800 meter race. Coached by Windsor’s legendary track guru Dennis Fairall, as of now Bishop is a two time Olympian. Her best placing was 4th in the women’s 800m, which occurred during the Rio 2016 Olympics. A highly decorated athlete, Ms. Bishop has won numerous world class recognitions. She was the gold medalist in 800m at the 2015 Pan Am Games in Toronto. Bishop has also won a silver at the 2015 World Championships in Beijing as well as two medals at the 2013 Jeux de la Francophonie held in Nice; a silver in the 4x400m and a bronze in the 800m. Melissa is widely admired for her courage and determination, and we are looking forward to continuing to cheer her on.